This is a review for hasu's TMK USB to USB converter. I decided to write a review for this little dongle because I think it's one of the most ingenious, exciting keyboard-related devices I've come across, yet a lot of folks still don't know it exists. Hopefully this review will help shed some light on this game-changing device. Let's start by taking a look at what the USB to USB converter is and what it does. 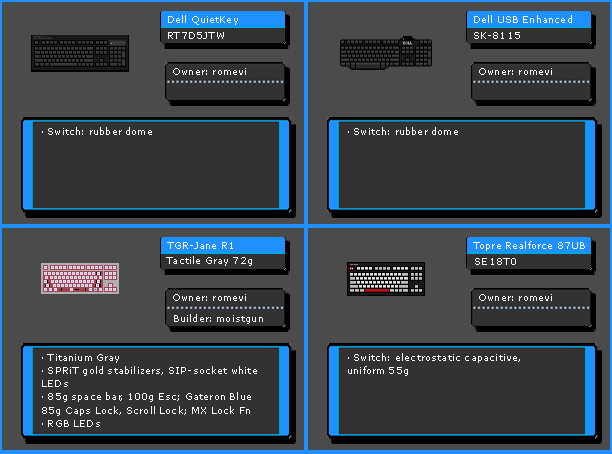 For the uninitiated, TMK is a highly-customizable keyboard firmware developed by GeekHack user hasu. TMK is primarily designed for AVR controllers, but it also has support for ARM-based boards like the Infinity. TMK supports a ton of features, including multiple layers, custom function key operation media keys, and mouse keys. TMK also supports a lot of other PCB-specific features, such as LED backlighting and even Trackpoint support, but those don't apply to a converter like this one. If you have an AVR-based keyboard controller, I highly recommend giving TMK a try. hasu also sells a custom TMK controller for the HHKB, and phosphorglow has created a custom Model M controller that runs TMK out of the box. I'm no TMK historian, but from what I've found, hasu's first TMK firmware threads date back to late 2012. hasu developed converter devices for ADB, PS/2, and IBM terminal boards, among others, which created a funny situation--through TMK, these old keyboards running obsolete protocols actually had access to more advanced capabilities than a lot of newer USB-based boards. To fix this, hasu created the USB to USB converter. The name USB to USB Converter is a bit tongue-in-cheek, as there is obviously no need to convert a protocol to itself. But for those familiar with the capabilities of hasu's other converters, this name makes total sense. This device can take any USB keyboard, old or new, and turn it into a fully-programmable one, customized precisely to your own specifications. And the best part is, this device provides that customizability to all of your USB keyboards. This, I believe, is the true magic of the USB to USB converter. Many 60% enthusiasts can recount the hours upon hours spent reprogramming their keyboards. This is kind of fun while you're experimenting with things like SpaceFn and macros, and perfecting a layout that's just right for you, but it quickly gets old as you have to reiterate the same configuration across all your boards every single time you make a change. Add to this the annoyance of switching to a full-sized board and realizing that you don't have access to the function layer controls you've grown used to. With the USB to USB converter, all of these problems go away. Simply flash your configuration once and it will work with any board you plug into it. Dvorak and Colemak users, never worry about hunting and pecking on a strange computer again. Simply throw the converter in your bag so you have it with you for use on other machines (granted, this may not be practical if the keyboard is plugged into the back of the tower under the desk, but still). The technical operation of the converter is surprisingly simple. 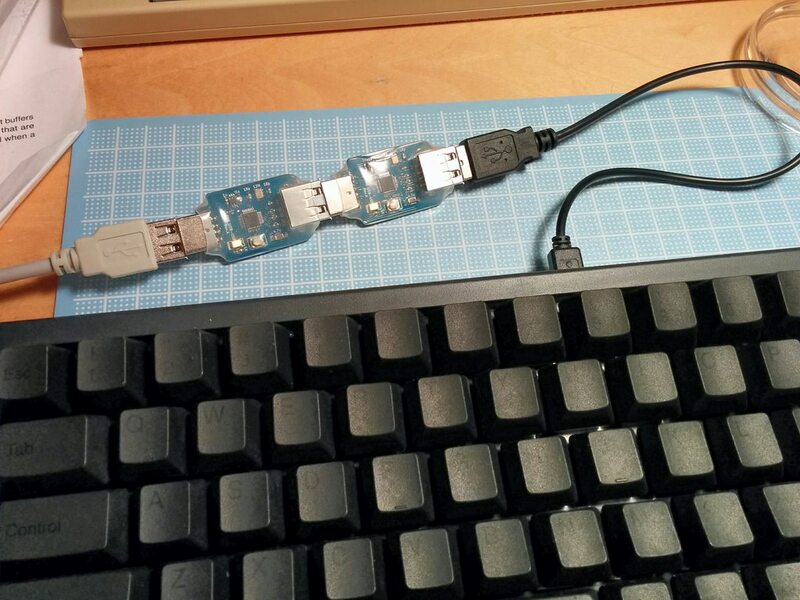 On the keyboard end, the converter acts as a USB host device, so as far as your keyboard is concerned it's plugged into a computer. On the computer end, it uses the same HID protocol as any USB keyboard. That means it supports USB HID features such as media keys and LED lock indicators. The converter is a small dongle with a male USB plug on one end and a female USB plug on the other. The PCB is double-sided, with the ATmega32u4 chip on the bottom, and the USB host controller and most of the other components on the top. The dongle is wrapped in clear heat-shrink tubing to keep it protected. The heat-shrink covers everything, including the reset button used to place the device in bootloader mode for flashing the firmware. I noticed two little slits had been cut in the wrapping on either side of the button, presumably to loosen the wrapping enough for the button to work. Even with the slits, the wrapping was still a little tight around the button, at least on mine, making it hard to tell when the button was pressed. Although the button worked fine as-is, I decided to cut away the wrapping and expose the button completely. This makes button presses much more apparent and gives me confidence that the button will not be accidentally triggered. The converter does not support NKRO output. I believe that an NKRO board will work with the converter, but the converter will only do 6KRO (boot protocol) on the computer side. ...although there's really no point in doing this other than to show off. Besides Fn keys, the converter also doesn't receive media key codes from the keyboard. It sends media key codes just fine, though, so you can program your own custom key combinations for media control. TMK normally supports virtual DIP-switches, persistent settings that automatically load every time you plug in the keyboard. Known as boot magic, these settings provide a simple way to configure common options such as Ctrl/Capslock switching, winkeyless operation, and default layer selection. But boot magic requires special key combinations to be pressed while plugging in the board, and this doesn't work with hasu's converters because they can't read the keycodes until the keyboard is finished booting. So for now, if you want to change these settings you'll need to manually modify the keymaps and reflash the firmware. hasu has suggested a possible workaround by adding a boot magic delay on startup, but this has yet to be implemented and there is no concrete roadmap to add this feature at the time of this writing. hasu initially developed the converter using an Arduino Leonardo with an add-on shield providing USB host support. Although he's now developed the smaller dongle version pictured above, he's made all the code and instructions available to build your own Arduino-based converter. He even provides enthusiastic support to those opting to build their own, even though he profits from the sale of his pre-made converters. I truly get the sense that hasu is deeply committed to the keyboard community. For what it's worth, I received my converter shipped from Japan to Cleveland, for about the same cost as I would have spent on an Arduino and a USB host shield. Another benefit of hasu's open-source approach is, of course, access to the code itself. If you've ever used another converter such as Soarer's teensy-based IBM converter, you may have found yourself frustrated by the limitations of a config file-based approach. Although it's well-documented, there are some things you just can't do, and support is purely on a best-effort basis. This is becoming increasingly problematic as Soarer has not been around much lately and hasn't updated the converter in a long time. Because nobody has the source code besides Soarer, nobody can fix bugs, add features, or otherwise improve it. Because TMK is open-source, you can customize it any way you like, provided you have the programming skills to do it. hasu has provided callbacks so users can create their own custom functions in C code without hacking the core. But if you don't know C, it's still relatively easy to learn how to create your own keymaps, or you can just copy an existing keymap from a large number of examples and modify it to your liking. My biggest complaint about the converter--really, a complaint about TMK in general--is the initial time investment to set up and learn. I run Windows on my main work computer, and I have not yet been able to compile TMK natively in Windows. Instead, I have a VirtualBox VM running Ubuntu Linux (something I already had for other reasons). 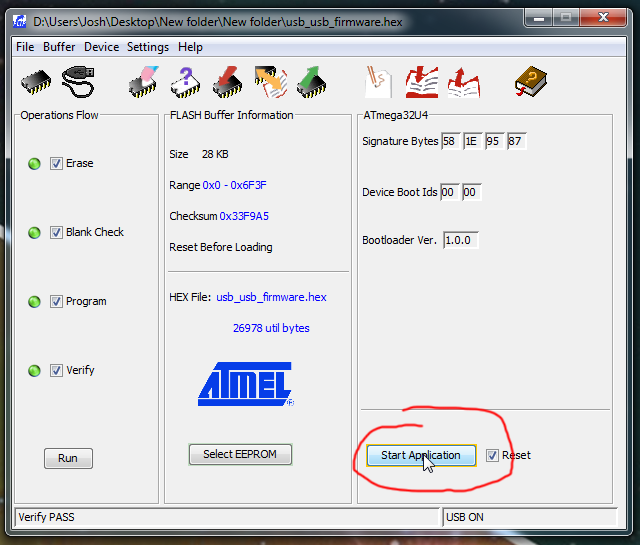 I do all my configuration and compilation in Ubuntu, then copy the .hex file over the virtual network to my Windows desktop, then use Atmel's FLIP software to flash the firmware. There is a bit of a learning curve associated with setting up a development environment and compiling your firmware, but that is a one-time investment that pays dividends in custom keyboard bliss. And having used a few of the alternatives, I consider this initial investment a small price to pay for TMK's broad feature set and immense configurability. I wholeheartedly recommend hasu's USB to USB converter. It's an incredibly useful device, and at $50 USD + shipping, one of the most economical in terms of bang for your keyboard buck. If you are someone who has found your one "end game" keyboard and never switches, you probably don't need this converter. But if you've ever found yourself accidentally entering HHKB shortcuts on your 1800, you may want to think about picking one up or building your own. Personally, I intend to try building another one based on the Arduino to use on my desk, and to keep this portable dongle in my bag for travel. I've been struggling to figure out what I could do with this. I'm trying not to buy stuff now unless I've got a purpose or plan for it. I've customized a layout on my IBM 6019284 that I'm very fond of and I think it'd be fun to export to other 60% boards. Thanks, man. I get you about not spending without a specific purpose. This converter is more of a utility item for sure. If you have a specific purpose in mind, e.g., getting keyboard X to work with feature Y, there is probably a more specific solution like a replacement controller or something. And if you have that luxury, a replacement controller is better than a converter because it can intercept low-level calls like built-in media keys and Fn keys, which the converter can't do. Personally, I'm at the point where I swap boards rather frequently. Going between a 60% and a fullsize board can induce a little bit of culture shock. This converter helps level the playing field. But if you've settled into using one or two boards which are already configured to your liking, there's not much need for this converter. In my review I mentioned plans to build another converter using an Arduino and shield. KAAAHN (sp?) and I were talking about doing this and adding LEDs to indicate the selected default layer. So for example, I type in Dvorak with SpaceFn, but I have a gaming layer in QWERTY with SpcaeFn disabled because it slows down the spacebar's reaction time. I've set up a dedicated Fn key to switch between them with Fn+G for gamer and Fn+D for Dvorak. It would be nice to have LED indicators for that. If I build a converter with an Arduino I've got extra pins for that kind of thing. I can also get one of the many available Arduino enclosures with LED openings for a nice, finished look. Thank you very much for the review and overview of the converter. I have been lurking for a long time only to look at the pictures of cool keyboards. And until this moment I had not realized what a blessing it is to have an open source firmwares like TMK! Where would I be able to get one? GB? There is a link in hasu's thread but it is admittedly hard to find. So I've updated the footer of my OP with a link to his artisan services thread where you can buy any of his converters. I know, and it's such a brilliantly simple idea that I'm kicking myself for not thinking of it. I had actually said to myself before, "I wish my USB keyboards had all the features of these older ones running through a converter." I guess I'm just not as industrious as hasu. Sounds like the PS/2 converter is definitely the way to go for NKRO. Glad it's working out for you. I've also been wondering about hardware-level access for LEDs and stuff. I just received the parts for my Arduino-based USB to USB converter yesterday, and I'm still working out bugs, but I'll be sure to document anything I find out about LED control along the way. Well, I've managed to build my own converter. I used an Arduino Leonardo clone and USB host shield, both produced by SainSmart. I bought off-brand components to save a few bucks. Also, Arduino.cc has stopped producing the Leonardo (travesty!) so I didn't have many other options. 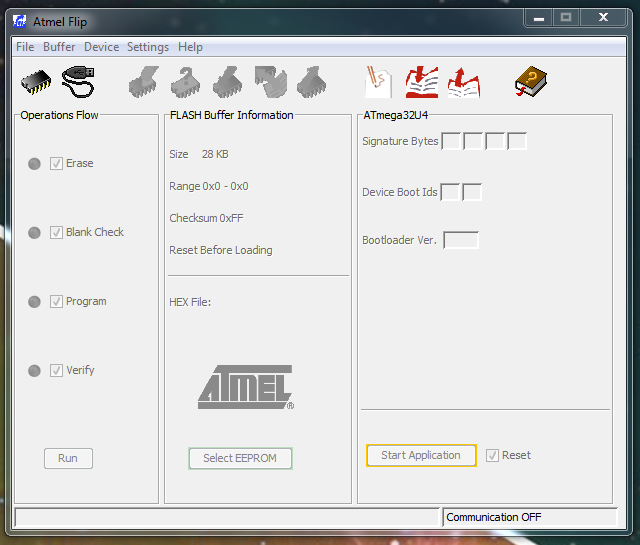 I ran into some problems because once I managed to successfully flash the firmware using avrdude, the converter wasn't responding. It turns out the off-brand shield I purchased didn't come with ISP headers installed, even though it was pictured with them in place. Fortunately I had some extra female headers lying around, so once I managed to figure out the problem it was an easy fix. This is a wonderful device! I will definitely get one when I have more keyboards. Both my current keyboards have been modded to become fully programmable (and one of them is using TMK ALPS PCB and running TMK!). I can't live without custom firmware keyboards! If I knew this converter earlier, maybe I will get this lovely converter instead of Frosty Flake and TMK ALPS PCB (which are also great purchase I never regret). TMK Alps64 w/ Matias Quiet Switches in KBP V60 case. Infinity60 with SKCM Orange Switches w/ TMK. CM Storm QRF w/ Frosty Flake controller, Cherry MX Blue Switches and TMK firmware. I also have a TMK Alps PCB, and I like it a lot. This device just makes all my other boards almost as good. For the most part this is true. However, I recently bought a new board (Varmilo VA87M) which doesn't work with the converter. It's either because the board doesn't support HID boot protocol (6KRO mode), or there's a bug in hasu's converter firmware. Still not sure which, or even how to go about troubleshooting. But that's an obscure edge case, because most USB NKRO boards support 6KRO out of the box, and they require a special configuration to switch to NKRO. At any rate, if it's a bug in hasu's firmware I'm sure we'll get it worked out soon enough. Not to mention that all of my other boards (about 20 of them) work just fine with the converter. Varmilo's firmware seems to be a little weird. I once saw on description of a Varmilo board on Massdrop saying that it does not work with Mac. I got linked here via the Alps party GB thread. I had no idea hasu had made this! I definitely had a lot of confusion and a learning curve to overcome when I built my first 60% alps using hasu's PCB (I look at any kind of code and my mind turns to jelly), but I've really come to love TMK. I deliberately avoid using my other boards now, simply because they aren't programmable like my alps is. I'm DEFINITELY going to pick one of these up to use with my other boards. @njbair: Excellent review. I would like to try the Hasu USB-USB converter. However, it would be helpful to have a step-by-step guide on how to program it. Does such a guide exist? I have checked the documentation in Hasu's thread and on Github, but I have not yet found quite what I am looking for. Thanks. Great review. I'll consider this when looking at getting a fully customized numpad/keypad/gamepad. Thanks! Didn't even know you did review. I have the PS/2 to USB, and it is a wonderful little device. Unfortunately, it does not get much use with my beam spring being the daily driver. Yeah, I feel like the converter didn't get much attention for such a handy device, so I thought I would write a review to help give it a bit of exposure. I still use the USB to USB converter daily. In fact, I made a second one from an Arduino Leonardo and USB host shield. I use that as my main, and keep the portable one handy for when I have to go work on a different machine. Instant Dvorak! After months of using my Filco with the converter, I finally broke down and ordered a Pegasus Hoof. Mainly because I want to remap Caps Lock to Ctrl (my HHKB Alps board has gotten me used to that setup), and the converter can't override Caps Lock. But I still have plenty of boards which will benefit from the converter, and it's still the best purchases in terms of, how did I put it in the OP, bang for your keyboard buck. Wow, this is neat! I've seen the name before but never bothered to give it a look until now. I don't know much about keyboard signals, but, as I've learned through the retro gaming scene, I have to ask: Is there any lag? Not that I can tell. And I've played Super Hexagon through this thing. The actual programming is the same as will all DFU-bootloader based boards: press the button to get into DFU mode, and then flash the firmware either with dfu-programmer of FLIP. A guide from the Alps64 board applies here as well, just substitute 'atmega32u4' for 'atmega32u2'. 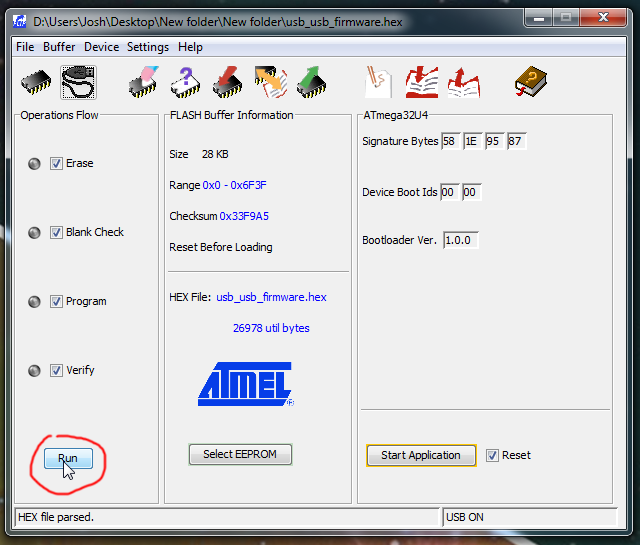 Explain It Like I'm Five (please): how to I flash my hex file to the adapter? I'm a new member with a notebook full of keyboard ideas and very little technical knowledge. I bought one of Hasu's converters based on your review to try some custom layers on my Poker2. The online keymap editor is wonderful for a layman like me, but despite my research I can't figure out how to load the hex file. I'll admit that much of this stuff is a bit over my head. I'm using Windows 10. What software do I need? Preface: I'm using windows 7, not sure if 10 has a different process or not. 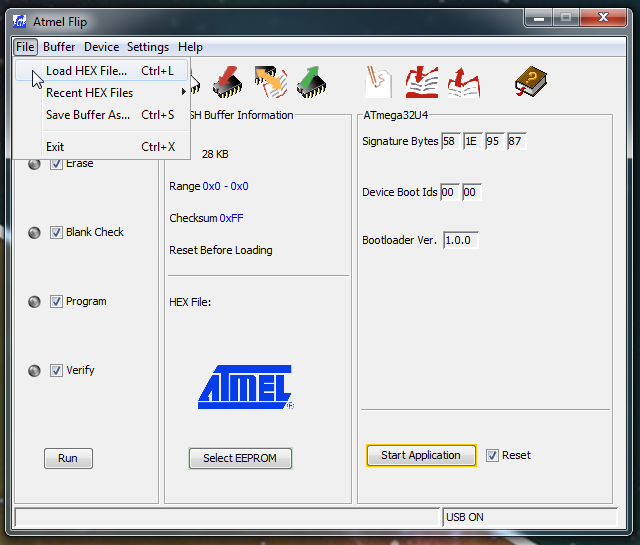 So once you have your hex file downloaded form the keymap editor install Atmel Flip from here http://www.atmel.com/tools/FLIP.aspx. Hit the button on the usb to usb converter to put it into the flashing mode, then wait a few seconds and hit the circled button, select "usb" then "open"
File > Load Hex File, navigate to the hex file you downloaded from the keymap editor and hit "ok"
Wait for it to do it's thing. Once finished hit "start application" and wait for it to reset. Thanks very much for the reply, Pemdas! This is immensely helpful and very clear. You've probably solved your problem already (in which case you could post your solution here). 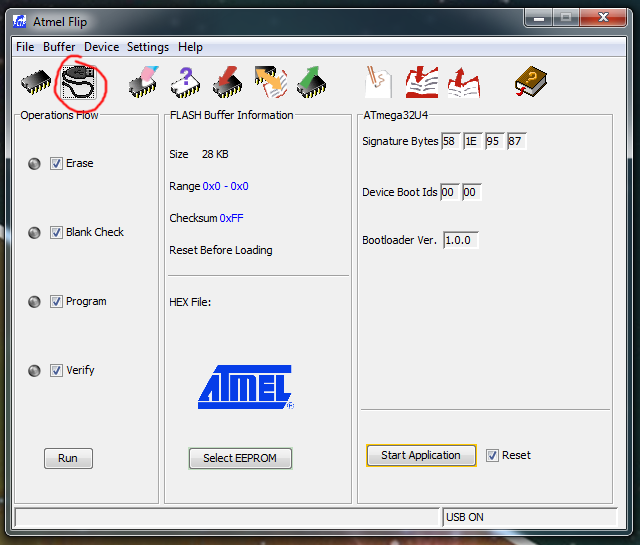 This error message means that the ATMEL DFU driver is not properly installed. You can try to follow this video, or simply google the error message. There are some threads on avrfreaks that deal with this. You're spot on, flabbergast. I just found the same video yesterday (after some very protracted searching) and was about to post my findings here. I followed the video's instructions to the letter and it worked! I'm off to the races and stoked to finally be configuring this converter, and I'm very grateful for all the help on this first project. Thanks! Very happy to say that I purchased the USB-USB converter from Hasu and got it running! It is so much easier now that Hasu has posted his online GUI configurator. You use the configurator to do your remapping and save the hex file. 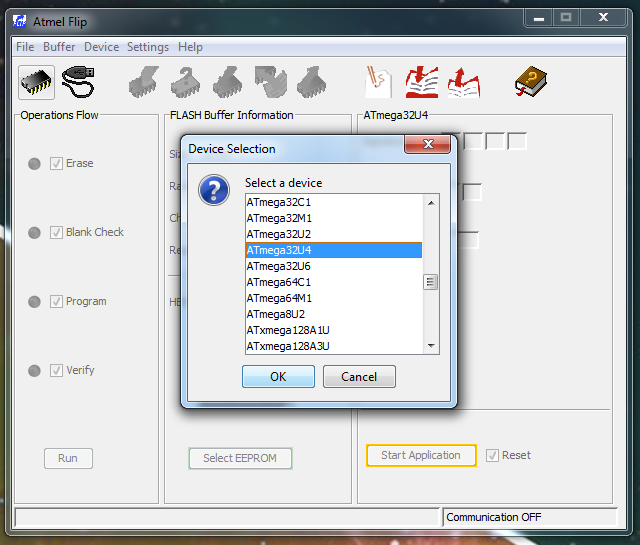 Then, in Windows, you can use FLIP to flash the converter, and you're all set. I programmed the converter to a HHKB layout and tested it with a V60MTC-C and a CM QFR. Both keyboards responded with the HHKB layout. One concern I have at this point is with the durability of the converter. Does anyone have good ideas about how to mechanically strengthen the converter so that it will stand up to repeated connects and disconnects? I would also like to travel with it for use on other computers. I am considering mounting the converter in an enclosure with short cables for stress relief connected to surface-mount connectors in the enclosure. The enclosure would have an easily removable top to access the bootloader button. @KHAANNN: Thanks for the suggestion about coiled Pexon cables. I have some short USB A M/F cables that I can use to provide some strain relief. I will also purchase one or two additional converters (one for the home office, one for work, and one for a spare or travel). EDIT: Thus far, I am using only the online configurator to generate my hex file. This seems to be working for the most part. However, the CapsLock and NumLock indicator lights are each working in opposite fashion. That is, when CapsLock is on, the CapsLock indicator light is off and vice-versa. In addition, on my RF87U, the CapsLock and NumLock indicator lights are each activated by sequential tapping of CapsLock, and I am getting mixed caps and numbers; I have had to disable NumLock using a DIP switch setting. How do I properly control the indicator LEDs so that, for example, the CapsLock LED is on when the CapsLock is on? It would be great if there were a setting for this in the online keyboard configurator GUI. UPDATE: I erased the USB-USB converter, used the online configurator to generate a new hex file, and reflashed the converter. This time, the CapsLock and its indicator LED worked as expected. I also explicitly remapped the Scroll Lock in the nav island to NumLock. Now, the RF87U works as expected with both CapsLock and NumLock. Damn. Doesn't support my new Ace Pad Tech Hall effect board. Page created in 0.135 seconds with 57 queries.